Our Tool Box provides devices, mechanisms, and strategies designed to enhance an individual’s or team’s ability and improve and maximize performance. 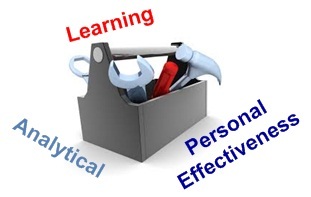 The learning segment offers tools and strategies to improve learning. Tools include learning style indictors, Myer Briggs Type Indicator (MBTI), multiple Intelligence, and brain dominance, note taking, and chunking information. The analytical section includes mechanisms to measure, evaluate, and analyze performance. The section provides SWOT analysis, PEST analysis, mind mapping, brainstorming, as well as other tools to analyze information, develop solutions and make decisions. The personal effectiveness section provides tools to enhance a person’s overall performance by offering guides for goals setting, emotional intelligence, time management, organization, habits creation, and other personal strategies.